Renewal is, at its core, a family business. Peter Michelson, CEO, founded Renewal in 2001 and was joined by his brother, David Michelson, president, in 2004. 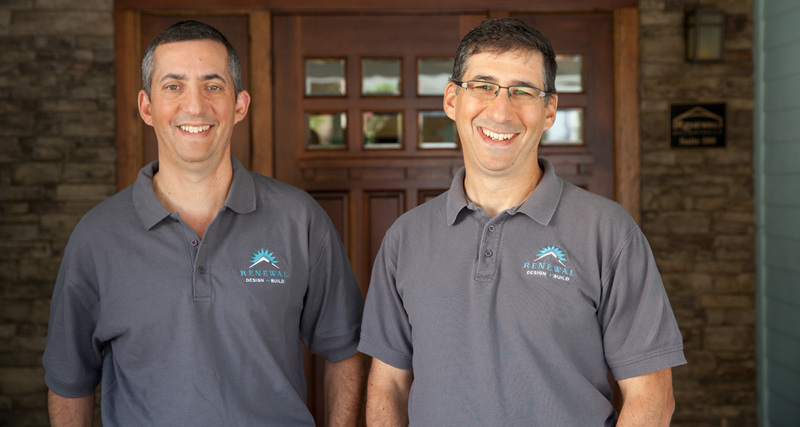 The Michelson brothers are fourth generation contractors who have a long and proud family history of construction. Their great-grandfather started a construction company in Boston in 1896. Growing up, they were always immersed in construction, either directly on the jobsite, or in discussion around the dinner table. How does Renewal stand apart from all the rest? We take care of it all. Your designer and builder are on the same team, so communication is streamlined with the goal of getting you back into your home sooner. From designs and finish selections to permits and historic approvals, we make every aspect of your renovation simple, straightforward and beautiful. Homeowner approved. In an industry with typically low referral rates, we’re proud to have achieved a 97% customer recommendation average and a five- star rating on the consumer review site, Kudzu.com. We take all feedback to heart and strive to improve client experiences every step of the way. No surprises with the Guaranteed Renovation™. Your project breaks ground with a guaranteed fixed price and completion date backed by our pledge to pay you $200 for every day beyond. Our detailed construction agreement covers every aspect of your project, so you don’t need to worry about hidden fees or unrealistic allowances. And, even after your project is completed, we guarantee our work with a three-year warranty. Outstanding design and craftsmanship. On time. On budget. Guaranteed. A leader in Atlanta. Serving Atlanta since 2001, Renewal is a Top 5 Residential Remodeler, ranked by the Atlanta Business Chronicle. We are consistently recognized nationally and locally, earning more than 70 awards for our beautiful designs, expert craftsmanship, and exceptional customer service. Communication. Open, honest communication is the key to a successful partnership. Working with our team, you will benefit from photo realistic drawings to visualize your space and consistent site supervision throughout construction. Our team listens closely to your lifestyle wants and needs and works diligently to provide creative and smart solutions. Passion: Every project, large or small, is treated “like our own” – and that’s why we exceed a 97% client referral rate, and our clients are raving fans. Innovation: Our highly experienced and creative staff of super stars design and build amazing innovative solutions that meet our clients’ wants and needs. Collaboration: We listen to our clients’ lifestyle wants and needs and keep an open channel of communication throughout the design-build process – between our in-house team, trade partners, and clients while valuing the opinions of others. Accountability: We take ownership of all our areas of responsibility and guarantee our projects are on time, on budget – every time. Pursuit of Excellence: We constantly seek better ideas, innovative practices, and continuous improvement – as a result, we are consistently recognized as industry leaders in the design-build community.